Rick Berry started down the martial arts path in 1963 when his brother-in-law gave him several copies of Black belt Magazine to read. He wanted to learn how to take care of himself but Asian martial arts training was put on hold until he finished his military obligations. What he found was not what he was looking for; it was much, much more. “It began at the Seibukan Shorin-Ryu Karate school in Norwood, Pennsylvania in 1965. The chief instructor’s name was Walter Daily who was a student of Grandmaster Zenpo Shimabukuro of Okinawa. After 8 months Mr. Berry switched to the Korean art called “Tae Soo Do,” which later became Tae Kwon Do, a catchall title in Korean. The actual system he studied is Ji Do Kwan, the Grandmaster of which is Chong Woo Lee of South Korea. The late Master C. K. Kim headed the Ji Do Kwan system in the United States. His immediate instructor in Chester was Steven McKnight and when he graduated from Crozer Seminary he turned his YMCA school over to Mr. Berry in 1969. Yes, he was going to become a preacher. Master Kim became his teacher even though he resided in New York City. Master Kim came down several times a year to instruct and conduct belt examinations. One year later several community leaders called on Mr. Berry suggesting that he open a club in the West End of Chester. They wanted Tae Kwon Do for those who could not afford YMCA memberships. When he opened a branch at the T.M.T. Community Center later that year, charging the students $10 per month. The “House of the Quiet Storm” was born. That school continues to this day. In 1983, Berry Sensei expanded his knowledge by studying Aikido in Philadelphia, traveling to that city several times per week. Since that time he has taught many, many students. They include doctors, lawyers, schoolteachers, college professors, commercial airline pilots, correctional officers and state and local police officers in Pennsylvania and Delaware. Berry Sensei holds black belts in three different arts: Ji do Kwan, 6th dan in Aikido and 7th dan in Dr. Moses Powell’s system of Ju Jitsu. 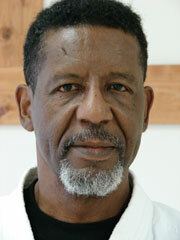 He is the founder of The Quiet Storm System, Aikido Kokikai Swarthmore, and Aikido Kokikai Delaware. Additionally, in 1977 Rick Berry, S. L. Martin of New Jersey and Pat Byrnes of Pennsylvania founded The United Martial Arts Referees Association. In August of 2004 Professor Rick Berry published his first book entitled “Stepping off the Mat.” It describes how to apply martial arts principles in everyday life. A revised edition of “Stepping Off The Mat” was published in 2011. To see Sensei Berry in action, watch this video of him throwing one of his black belt students at the Kokikai Aikido summer camp in 2007.